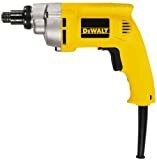 DEWALT DW282 6.5-Amp Variable-Speed Reversing Positive Clutch Screwdriver buy / read reviews : Amazon.com Tools and Hardware Store. The DW282 positive-clutch screwdriver gets the big jobs done faster with a 0 to 2,000 rpm, 6.5 amp motor. This unit is designed for assembly and production environments, delivering more torque for the most demanding applications. The two-finger rubber trigger makes the tool comfortable and easy to use, while helical-cut steel gears with a metal housing ensure smooth operation and increased durability. This unit also features a 1/4-inch quick-change bit holder.